This beautiful rhinestone collar is 3/8 inch wide and Made in the USA. This collar is available in Velvet or Vinyl. This collar comes with beautiful clear rhinestones that are secured in jewelry settings. In vinyl we have red, blue, black, pink, gold, silver or turquoise. In velvet we have red, black, pink or purple. Size 10 will fit a dog with a 6-1/2 to 8 inch neck. Size 12 will fit a dog with a 8-1/2 to 10 inch neck. Size 14 will fit a dog with a 10-1/2 to 11-3/4 inch neck. 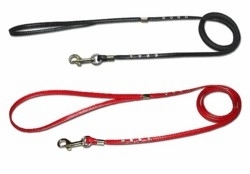 Vinyl Leash with Rhinestones 1/4 x 4ft.